From health trackers and power-bank smart-strollers, to breast-feeding re-imagined and smiling sleep assistants, startups are raising the stakes on technology that helps raise a child. Jaganath “CJ” Swamy had always considered himself a diligent parent, but an experience playing at Golden Gate Park with his six-year-old son Eashan left him wonder if he couldn’t be parenting smarter. After an outing spent happily running around in the park, Eashan, a typically healthy and active child, wound up getting sick with a high fever. A trip to the doctor revealed that the young boy was suffering from heat exhaustion and mild dehydration. It occurred to Swamy that if he’d strapped a health tracker onto Eashan’s wrist, he would have been able to react more quickly, as he never saw his son’s illness coming. But after doing a little research, he realized such a gadget didn’t exist. “And that’s where the idea for creating the worlds first health and wellness tracker for young kids came from,” explains Swami, the CEO of GoodParents. Enter GoodParents’ Kiddo, a new children’s health tracker and part of a recent wave of tech products marketed at parents. “When people think of fitness tracking, they think of adult oriented trackers focused on activity or exercise. This is not really a relevant concept for kids—Health and wellness tracking (which includes activity and sleep tracking) is a much bigger issue and is really about taking a personalized, actionable insight driven approach to health data,” explains Swamy. Like Swamy, a new breed of entrepreneurs are trying to fill nurseries with high tech products that don’t exist yet on the market. But will they take off? There’s certainly an interest in high tech products amongst moms, 76% of whom according to The Bump’s Moms & Tech Survey say technology plays a big role when they’re considering what products to buy. That said, new and expecting parents aren’t yet showing their love of tech products with their wallets just yet. According to Market Research group GfK, electronics accounts for just under nine percent of baby product sales. Yet startups like Swamy’s continue to try to tap into unmet needs. Breast pump technology, for instance, really hasn’t kept pace with new developments in the tech world. Many of the pumps on the market look incredibly uncomfortable, are noisy and indiscreet and even make their wearers complain that they feel like cows. “For decades, women have struggled to keep nursing, as they go back to work, or to keep up with hectic family schedules, often because they have to stop what they are doing and get to a private place to pump,” explains Naomi Kelman, the president of Willow, a startup that has reimagined the breast pump. Willow aims to bring “the mobility, humanity, and dignity to the pumping experience that women so rightly deserve,” explains Kelman, allowing women to breast feed on-the-go without having to put their careers and lives on hold. Here’s how Willow’s pump is different from others on the market: “It’s the first all-in-one breast pump that fits into a woman’s bra with no dangling bottles, external tubes or cords to hold her back,” Kelman says. The company promises that the pump “works quietly,” so moms can go about their days. “We’ve heard so many inspiring stories about moms who were able to pump while they ran errands like grocery shopping, while taking conference calls—without having to hit the mute button—and even while commuting on the train,” adds Kelman. The notion that new moms are going to want to keep working is grounded in reality, as many can’t afford to stop: 42 percent of mothers in 2015 were the family’s sole or primary breadwinners, according to a report from the Center for American Progress. It’s not that much of a stretch then, to imagine mothers might want products that enable them to stay plugged in while they’re literally on the go. Smart strollers are another product on which the wheels are certainly in motion. “As we started to think about a younger generation of parents and their needs, we discovered that technology was not just a ‘nice to have,’ but expected. This fueled our idea for the moxi stroller,” explains Dan Silianoff, product manager for moxi, a self-charging, app-connected stroller from 4moms. “Parents can charge their cell phones or keep track of their mileage, time and calories; and the headlights/taillights feature allows them to take a walk at dust and be seen by passing cars,” he adds. It’s not just parents who are getting more plugged in—many products, like Urban Hello’s sleep tracker Remi, get children involved in managing their own health from a young age. Urban Hello’s founders Hervé Artus and Catherine Seys launched Remi because of their own experiences as parents with children who’d get out of bed in the middle of the night, waking them up and repetitively asking if it was morning yet. 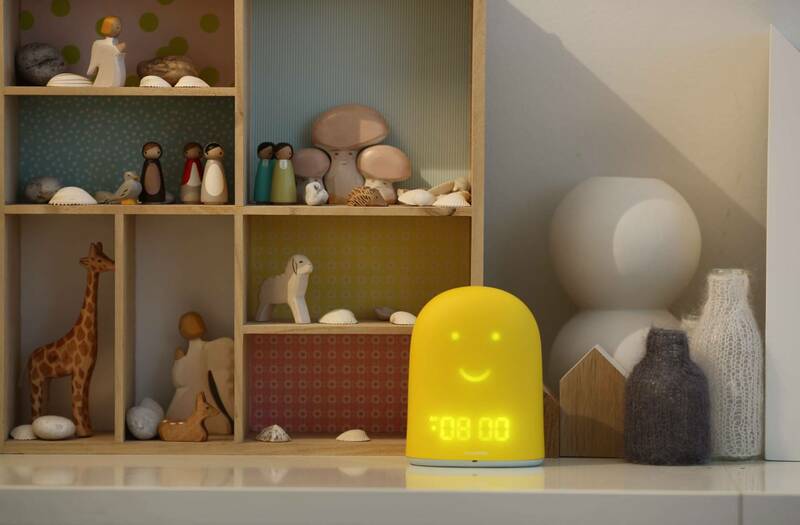 Remi uses the simple trick of displaying smiling illuminated faces to tell kids when it’s time to go to bed and wake up—if the smiley face has sleeping eyes, the child knows to stay in bed, and if it’s awake they know it’s okay to get up. Plus it also functions as a baby monitor, alarm clock and music player. “Making a child go to sleep at the right time and making them stay in bed until the right time seems to be a universal challenge!” write Artus and Seys in an email. While we’re not likely to see the new generation raised by robot nannies just yet (though to some exhausted parents that might sound appealing), it’s likely that the tech startups that provide such simple, innovative solutions to the universal challenges and annoyances of parenting–like getting your kid to stay in bed, or to brush their teeth, or breastfeeding without people staring at you on the train–will have a competitive edge in an oversaturated parenting tech market. Lizzy Hill is a tech and lifestyle journalist, with bylines ranging from CBC to Vice and Marie Claire. She's a huge tech nerd, who wants to hear all about the latest gadgets, whether they're robots that fold your clothes or smart fridges that tell you how to live your life. And it's fair to say that she has probably consumed way too much science fiction for her own good. The breast pump is quite ancient in terms of getting a technology upgrade. It is nice to see engineers taking a closer look at that in order to make the process a little more comfortable for the women out there. I like to see all of the technology gadgets coming out for parents. There are many tasks that can be supplemented with technology and will take a little more stress away allowing you to focus more on the important stuff.